"The stove," I said. "What about the stove? You didn't say one way or another. Can I use it? 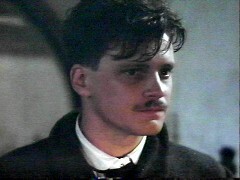 The rain...like today...." My stammer put him off for a moment or two. "Do you believe in hell, Mr. Birkin?" Hell? Passchaendaele had been hell. Bodies split, heads blown off, grovelling fear, shrieking fear, unspeakable fear! The world made mud." Birkin was a "signaller, one of the most dangerous duties at the front. During the Great War, communications were always a problem. Attacks were often launched across broken ground, with the situation often very unclear, so it was very important to be able to get the latest information back to those who were conducting the battle. Signallers were responsible for this. 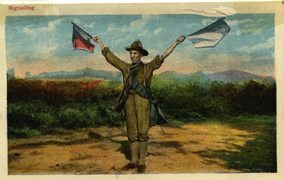 Signallers had to learn Morse Code, or Semaphore using flags. Flags were pretty useless, when you come to think of it. During the Somme battles, for example, when whole battalions of men left their trenches to attack the Germans, they discovered that the Germans had not all been killed by the preliminary bombardment. 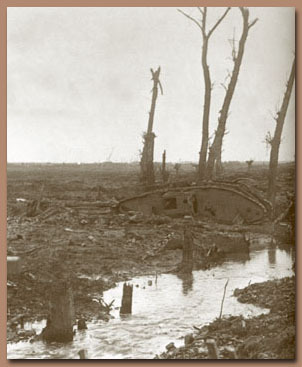 The attackers were often pinned down in No-Man's Land, between the trenches. Anyone who stood up and started waving flags around would have been an immediate target. So you can see how the job was certainly dangerous. Signallers were often used as "runners" - that is, soldiers who had to stay by the local commanding officer in any attack, and take handwritten reports and messages back to the nearest next senior officer capable of making decisions. This often entailed dangerous journeys in the open, across exposed ground. "Runners" were often sent off in pairs with duplicate messages, the expectation being that one, if not both, would probably be killed, as they would be the only moving objects in an otherwise static landscape. But each Company (about 60 men) had its runners, and they were not always trained signallers. 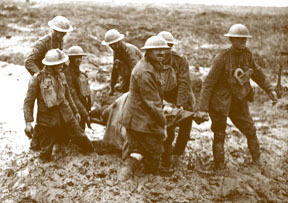 By the time of Passchendaele, signallers had acquired another duty - that of maintaining telephone communications with their immediate headquarters, which entailed following up any attack, and running telephone cables back to the nearest headquarters - often a dugout in the trench from which the attack started. Whenever the Germans were attacked and driven from a certain position, they inevitably launched a counter-attack, and this would be accompanied by an artillery bombardment of the old No-Man's Land across which any reserves would have to come to assist the troops being counter-attacked. 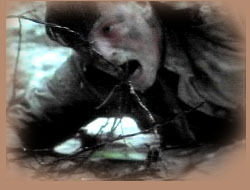 These bombardments often cut the telephone wires, thus leaving no way of telling those behind was was happening up in front, so signallers would have to climb out of their newly-won trenches, and scuttle across No- Man's into the bombardment, running the telephone wire through their hands until they came to the break. They would then repair it and go back, often to find that the line was still dead because there was a further break beyond the one they had already found, or because there was a new break which had occurred while they were on their way back from the first repair. Signallers often went out to look for breaks, never to be seen again. For the British; Passchendaele amounted to the horror of warfare in a morass, in a surreal world where men and animals simply vanished in pools of mud. Just getting to the front was a horrendous experience: horses and men slipped off roads and disappeared before they could be rescued. Later that day Vaughan noted, 'The cries of the wounded had much diminished now, and as we staggered down the road, the reason was only too apparent, for the water was right over the tops of the shell-holes'. Haig had not fully appreciated the effects of fighting in such terrain, just as he had underestimated the enemy he confronted. Time and again he saw the Germans as on the brink of collapse; time and again he urged one more push to bring about the breakthrough that he knew somehow was just around the corner. During a period of dry weather in late September the British Army delivered three limited attacks, taking ground at Menin Road Ridge and Polygon Wood. Buoyed by these successes, Haig wrote in his diary on zs September that 'the enemy is tottering and ... a good vigorous blow might lead to decisive results'. Not at Passchendaele. For the rains returned, but Haig - and his commanders - pushed on as if the sun were still shining. 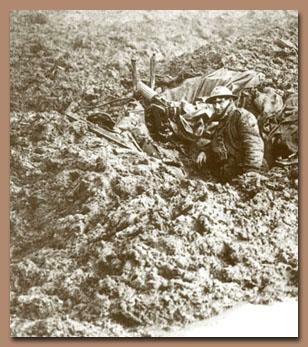 The enemy,' Gibbs went on to venture, 'may brush aside our capture of Passchendaele as the taking of a mud-patch.' He was right. The ruined village had no tactical, let alone strategic, value. After the rubble was taken by Canadian troops, Haig finally called a halt to the offensive in November, with little to show for the quarter of a million British casualties but the 'slaughtered masonry' of the village which had given the battle its name. Haig had not even fought to a draw in this 'breakthrough' battle turned bloodbath. Germany, while hurt badly, had lost fifty thousand fewer men than Britain. Not all the blame goes to Haig for continuing the battle. Lloyd George, the British Prime Minister since December 1916, had voiced his misgivings before the campaign began and reserved the right to call off the battle; but like all the others in positions of authority, be offered no alternative plan. Lloyd George did nothing to stop the killing. On 3 January 1917 Douglas Haig was promoted to held marshal, the highest rank in the British Army.